It has been far too long since I have posted. Life has certainly been busy these past few months. Since my last update on July 22, 2011 so much has happened. I got a job, joined a new sports league, made new friends, gone through a lot with old friends, settled into a new apartment, and started my post-college journey through life. All of this, and more, has swept me away from blogging (and sometimes cooking). Finding ways to balance all parts of my life has been somewhat of a challenge, but I believe I am starting to get the hang of it (more thoughts on this to come in a new years post). And so, here I am, finally taking the time to sit down and write about my beloved passion: cooking. Seeing as todays date is December 23, it is fair to say we are in the midst of the holiday season. In some places it is getting cold (or if you’re in DC, its oddly warm) and everyone is bundling up. Twinkling lights adorn buildings and trees, and the warm-fuzzy-joyful holiday feeling fills your insides. Naturally, this means it is time for some holiday cookies. 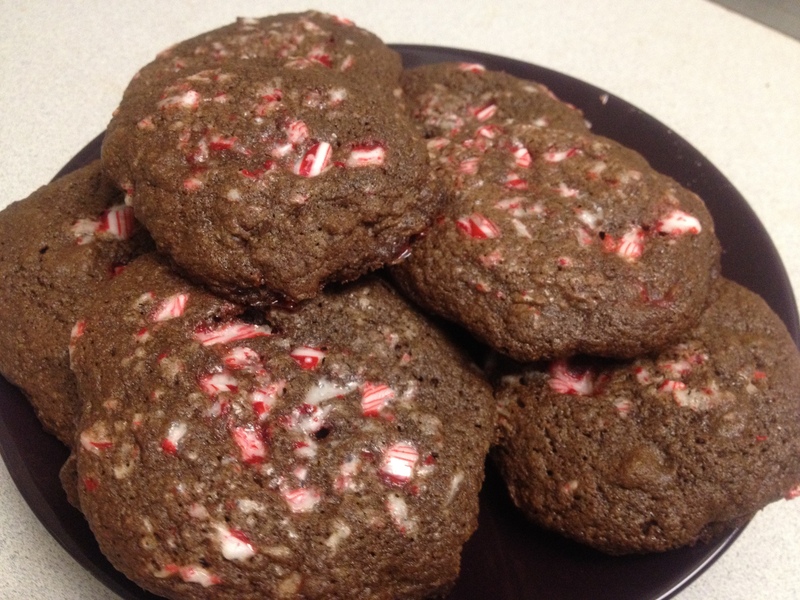 I decided to dive right in and make Chocolate Choco Chip Candy Cane cookies (gotta have the candy cane!). Mix together all ingredients except chocolate chips and candy canes. Smash two candy canes, and fold in candy cane pieces and chocolate chips. Place balls of batter on cookie sheet and sprinkle remaining candy cane pieces over the tops of each ball of batter. This is by far one of the simplest cookie recipes I have ever made. And did I mention delicious? Actually, I thought they could have used a bit more peppermint flavor. I was discussing with a coworker and debated between adding more crushed candy cane or a few drops of peppermint oil. I believe either would do the trick. Nonetheless, these cookies were a huge success at the multiple holiday parties they made an appearance at.